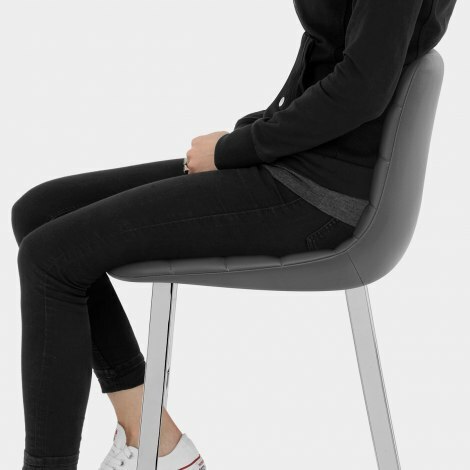 Making a memorable impact in your bar area, the Scala Bar Stool Grey is a fantastic design that stands out from the crowd. A perfectly formed modern piece of furniture, the Scala makes a stylish accompaniment for a variety of interior settings. The eye-catching seat and high backrest are stitched into horizontal segments for excellent visual impact. 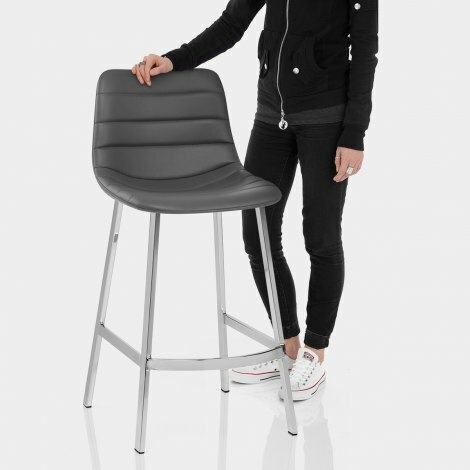 Meanwhile, the grey faux leather gives a luxury look and dense foam padding ensures a comfortable seat at the bar. The welded four-legged frame keeps the stool at a fixed height, ideal for use at the kitchen worktop or breakfast bar. Superbly stable, the mirrored chrome frame also comes with rubber pads beneath to help protect from scratches, and the curved footrest finishes off the package, adding to the desirability. "Comfortable, stylish and value for money"
Travelled by train & walked to the store in central Birmingham. Found exactly what we wanted from a huge choice. Lovely people, very helpful and informative. Delivered to our home the following day at no extra charge. Highly recommend. Fast, efficient service and an excellent product. Thank you. Delighted with these stools, really well made, comfortable, stylish and value for money. We originally bought cheaper ones from elsewhere but returned them because they were poor quality. These are perfect.